Adventure around Dhaulagiri, leads you to marvelous scenery of high mountain range within Nepal Far North West Himalaya that extends to Dolpo and Mustang areas, a massive bulk of mountain listed as world seventh highest Mt. Dhaulagiri at above 8.167 m and 26, 795 ft first conquest by Swiss Expeditions with Nepalese guides Nyima Dorji and Nawang Dorji Sherpa in May 13th 1960. Since then Mt. Dhaulagiri is climbed frequently from the North West Base Camp side, where our adventure leads on the same route through its massive remorseless fields of moraine-ice and glaciers at Dhaulagiri Base Camp after a scenic and fascinating walks from low warm farm areas to alpine cooler hills filled with lovely green forest to end at fantastic spot at base camp beneath towering North Face of Dhaulagiri. 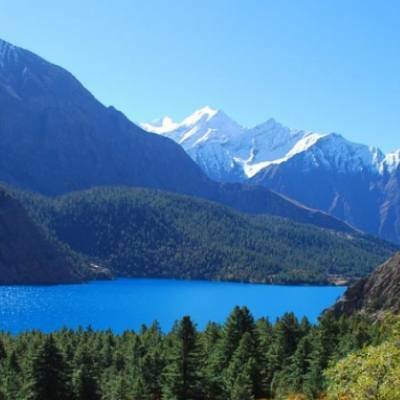 Adventure around Dhaulagiri begins with exciting overland journey towards Nepal Mid West reaching at scenic and beautiful Pokhara, a leading and renowned city blessed with natural beauty of mountains-green hills and lakes. From Pokhara our journey continues leading farther west past Mygdi town of Beni to reach our starting point of the trek at Darbang, where walk follows Mygdi River upstream right up to its glacial source at Dhaulagiri base camp. Walking past remote and isolated farm villages and then into high hills covered with tall rhododendron-pines-oaks and fir trees as our adventure progress leaving behind human settlement and villages as well green vegetation and tree lines to complete wilderness of mountains and glaciers to reach at base camp. From Dhaulagiri base camp walk leads over highest spot of the trek at French pass above 5,350 m high with sweeping panorama of whole Dhaulagiri range of peaks and then downhill to scenic Hidden valley and crossing the last Thapa or Dhampus pass to reach back into tree lines and then downhill to Marpha a charming village situated at Kail-Gandaki River at Mustang area. After completing our magnificent walks on Adventure around Dhaulagiri taking a short drive to Jomsom airport for panoramic short flight to land at beautiful Pokhara where our great Adventure Around Dhaulagiri concludes with overwhelming memories of life time experience. 1 Day 1: Arrival in Kathmandu and transfer to hotels.On reaching Kathmandu Tribhuwan International Airport where you will be warmly received by our guide and staff and then transfer you to your respective hotels in the hub of Kathmandu city. First check into your hotel rooms on getting refreshed from the flight and with Jet-Lag, then join with other members of Adventure Around Dhaulagiri for group briefing, where our expert guides will inform regarding your stay in Nepal, hotels, trekking, local lodge and overland drives with do’s and don’ts information, evening welcome group dinner in authentic Nepalese restaurants with Folk cultural programs to entertain you during your meals. 2 Day 2: In Kathmandu with sightseeing tour around world heritage sites.Morning after breakfast leave the hotel for exciting guided sightseeing around Kathmandu where our city guide will lead you to places of interest, Kathmandu a metropolitan city still retains its ancient heritage and varied ancient culture where you will visit world heritage sites around Kathmandu for half day or full day. After an interesting and wonderful tour of ancient historical and religious sites around Kathmandu, with afternoon free preparation for next day journey to Adventure Around Dhaulagiri. 3 Day 3: Drive to Pokhara 860 m - 06 hrs journeys.Morning taking an exciting drive with scenic views of Himalayan peaks, as ride leads on Nepal’s busy highway past many towns and farm villages then reaching at Nepal Mid West warmer areas at beautiful Pokhara city and its scenic valley. Pokhara blesses with natural beauty of rolling green hills, high and massive Annapurna Himalaya with magnificent Machapuchare Himal ‘Fish Tail’ that reflects on its serene Phewa and Begnas Lakes. On reaching Pokhara transfer to hotel by the Phewa lakes with time for stroll around the lake side of great interest with views of Annapurna mountain range. 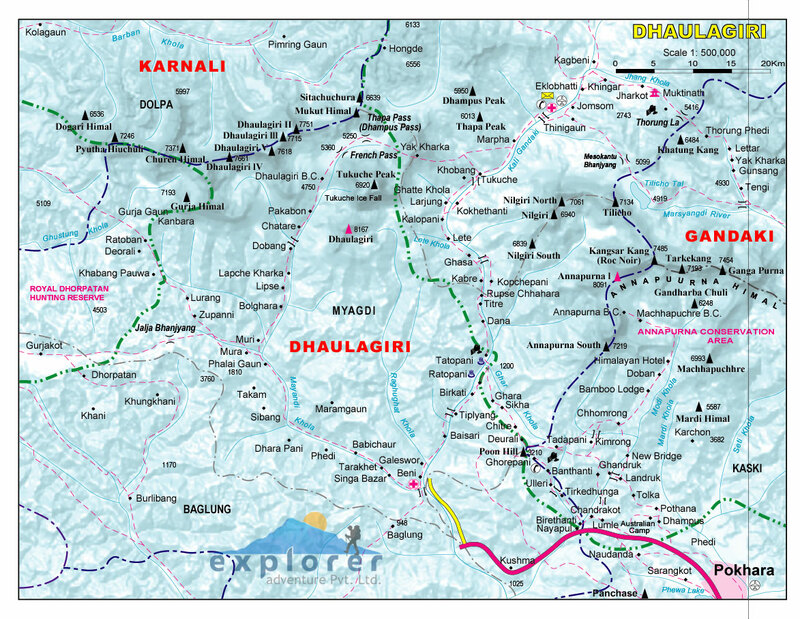 4 Day 4: Drive to Darbang 1,200 m via Beni 900 m -06 hrs.Starting our Adventure around Dhaulagiri, taking an exciting drive beyond Pokhara towards far western direction with views of Annapurna peaks along the drive to reach at Beni, headquarter town of Mygdi districts. From Beni drive leads past many farm fields and villages following the Mygdi River to Darbang, a small farm village turning into a town due to establishment of motor road network, an important village which lies on the route to Dolpo and other far western areas of Nepal as well towards Dhaulagiri base camp. At Darbang for overnight stop in a nice local lodge with time to immerse within Nepalese culture and short excursion around this lovely farm village located by the Mygdi River. 5 Day 5: Trek to Khamla (river side) 925 m - 05 hrs walks.Our adventure starts from this village with first day walks crossing over Mygdi river on a suspension bridge, where our route winds up for an hour, after leaving the river below as climb of an hour reaching at farm villages and then back into the same river to reach a remote and isolated Kamla village with first night in tented camps for overnight by the river side. 6 Day 6: Trek to Bagar 2,375m - 06 hrs.Morning begins following the river for an hour to reach at Jugepani a small farm village with few houses and shades, with possible lunch break and then walk leads to a steep climb to reach a ridge top within thick forested areas. From the hill top descend into forest to reach our overnight camp at Bagar, a farm village and the last human settlement before Dhaulagiri base camp and beyond till our adventure ends at Kaligandaki areas in Marpha village. 7 Day 7: Trek to Dovan 2,600m - 06 hours.Morning walk leads past farm areas of Bagar village and then climb into forested areas of bamboo, oaks and rhododendron trees, after a steep climb on a narrow path where walk leads to a long descend to reach our overnight stop at Dovan, a place within forest surrounding with small teahouse and shops. 8 Day 8: Trek to Chartare / Bhainsi Kharka 3,000m -05 hrs.After Dovan, morning walk follows top cross a wooden bridge over confluence of Mygdi River, from the bridge back into dense forest with short ups and downs and then countering our route to reach at Chartare also called by the name Bhainse Kharka for overnight stop within forest surrounding. 9 Day 9: Trek to Pakhaban (Japanese Camp) 3,750 m - 05 hrs.From here on in complete wilderness of dense forest and mountains, as walk leads past lush vegetation and tree lines reaching an area within glacier and moraine called Italian Camp, just beneath Dhaulagiri Southern flank. Enjoy the views of Putha Huinchuli, Manapathi and Dhaulagiri south flank, as walk continues over glacier and then climb over rocky ridge to reach at Pakhaban which is also known by the name as Japanese camp. Our overnight camp offers views of Dhaulagiri South West Face with Manapathi, Puttha Hiunchuli including huge ice wall of Tsaurabong Peak. 10 Day 10: Trek to Dhaulagiri Base Camp 4,748 m - 06 hrs.Enjoying views from this isolated campsite, morning walk leads to our main destination at Dhaulagiri base camp and the highest campsite of the trip, as walk follows over moraine and huge iceberg, one has to be cautious walking around this glaciers section. Following our expert guide on glaciated areas and then once past over glacial section reaching our overnight campsite at Dhaulagiri base camp located just beneath towering peaks of Dhaulagiri and its massive ice falls. From the camp stunning view of Mt. Dhaulagiri I at 8,167 m, its huge icefalls, glacier with Tukuche peak includes West peaks of Dhaulagiri II (7,751 m.), Dhaulagiri III (7,715 m.) and Dhaulagiri IV (7,618 m.). 11 Day 11: Trek to Hidden Valley 5,140m via French Pass 5,360m - 05 hrs.After a scenic and wonderful stop at Dhaulagiri base camp, morning walk leads over moraine and ice with glacier at close distance from Tukuche Peak, where walk leads higher to reach the highest pass of the adventure at French Pass at 5,360 m high. From the pass descend towards a wide valley full of grassy meadow at hidden valley for overnight camp, reaching our camp with grand views of Sita Chuchura, Mukut Himal, and Tashi Kang 5,386 m, Tukche Peak and Dhaulagiri I. 12 Day 12: Trek to Yak Kharka 4,915m via Thapa / Dhampus pass 5,244 m - 05 hrs.Slowly our adventure comes to an end on leaving Hidden Valley as morning leads on ling winding path to reach at Thapa also called as Dhampus pass of above 5,244 meters high. After crossing the last pass of this great adventure offering rare and exclusive views of Annapurna Himalaya range with Nilgiris peaks, after the pass on downhill to Yak Kharka to our lasty overnight camps within green vegetation of Juniper, Burberry and rhododendron bushes with views of snow capped peaks. 13 Day 13: Trek to Marpha 2,630 m - 05 hrs.Our final and last day trekking ends with long descend towards Kali-Gandaki River valley to reach at Marpha village, one of the most charming villages in whole Himalaya. Morning starts entering into forest of confer with rhododendron-oaks-pines and fir tree lines as walk descends all the way to Marpha village, located by the Kali-Gandaki River on the popular Annapurna circuit trail. 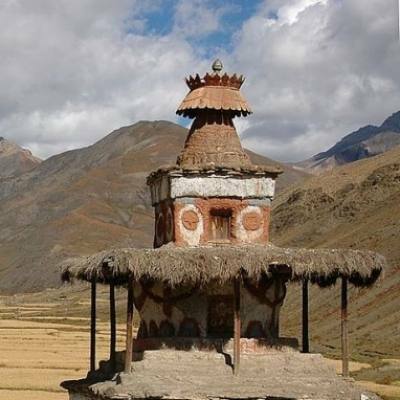 Marpha village of Thakali people, been on trade with Tibet with long history settled on Old Trans-Himalayan Salt Trade / Caravan route of Nepal and Tibet situated within Mustang district. 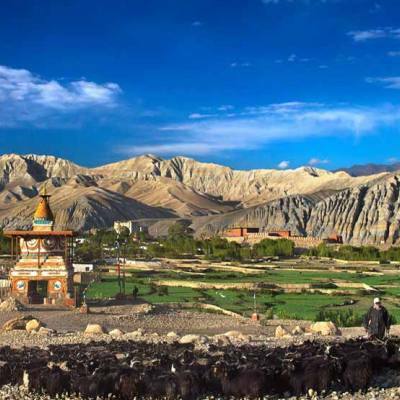 14 Day 14: Drive to Jomsom 2,715 m and Fly to Pokhara 860 m and transfer to hotel.From this charming village of Marpha our adventure completes taking a ride to reach at Jomsom, headquarter town of Mustang area, an interesting town inhabited by Thakali people of Buddhism religion, with long history of trade with Tibet as this town situated on main old Trans Himalayan salt and caravan trade of Nepal and Tibet. 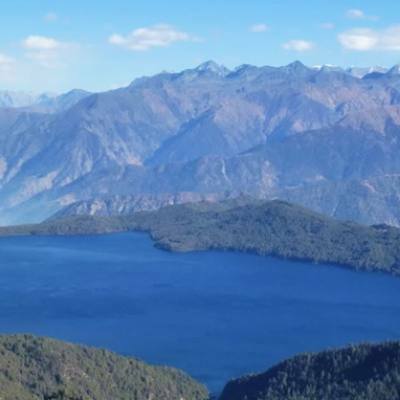 Our last day of the adventure completes taking an early morning short drive to Jomsom small airport for super scenic short flight to land at picturesque Pokhara and then transfer to respective hotels by the Phewa lake side. 15 Day 15: Drive or fly to Kathmandu and then transfer to your hotels.Morning transfer either car-coach or tourist bus (as per the size of the group), for drive back to Kathmandu with scenic views of mountains, green scenery of hills and farm fields within nice villages and towns as drive brings you back at hustle and bustle city life of Kathmandu. On reaching Kathmandu transfer to your respective hotels with time for individual activities and shopping souvenirs. 16 Day 16: Depart for international flight home ward bound or to respective countries.Your last memorable day in Nepal after a wonderful experience on Adventure Around Dhaulagiri with great service of Explorer Adventure, and as per your international flight then transfer to Kathmandu international airport for homeward bound or to your respective destinations. Highest elevation gain: 5,350 m at French pass and Thapa-Dhampus pass 5,244 m.
Region of Journey: Nepal Far North West Himalaya around Mygdi and Mustang districts. People and Culture: Magar hill tribe of mixed Hindu and Buddhist with Thakali Buddhist religion, culture with age-old custom. Walk and drive: From minimum 4 to maximum 6 hrs. Season: April to June and September to Mid December months.